I’ve got some exciting news friends – after a few years of silence in the blog world I’m writing again. This past summer a local radio station approached me and asked me write and voice radio features for them centered around encouraging singles. With that I’ve launched a new blog – More Than Single and this week both the blog and radio features went live. I’m excited for this new adventure, and hope you will join me over there. I will primarily be writing on singleness, dating, friendships and community. I have not fully decided what I will be doing with this blog yet, whether I’ll be keeping it or shutting it down. For now I’m leaving it up, but will primarily be focusing on More Than Single. Check out my welcome post here to hear the vision and story behind More Than Single and links to the radio features that are all posted online. I’m also on Instagram as @morethansingle and would love to see you over there. Thank you for being loyal readers and friends. You have been a big part of my journey, and I’m deeply thankful for you. Categories: relationships, singleness | Permalink. 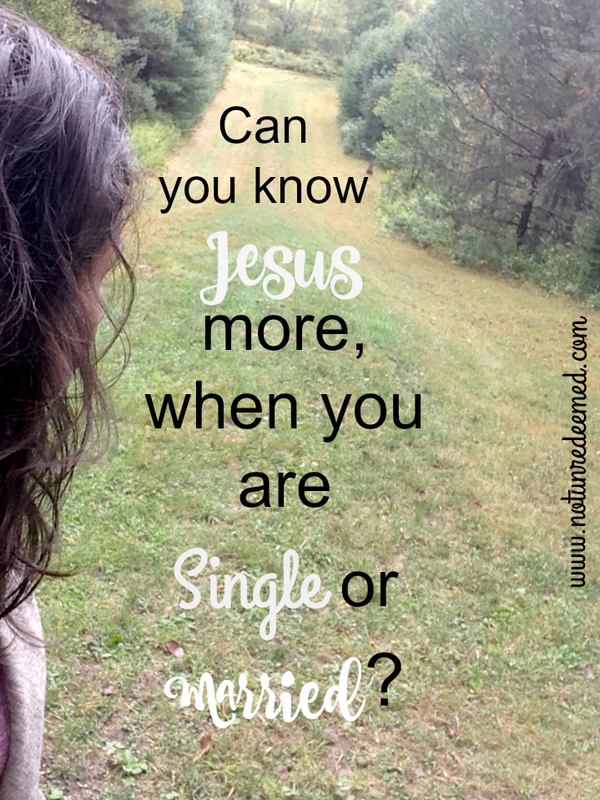 Can you know Jesus more when you are single or married? I sat in silence for a long time over that question. However I answered would take the conversation into so many different areas. We could argue over Paul’s writings and wether or not it was better to be single or married, we could dive into Jesus’s set apart life, or maybe the examples of marriage and Christ’s love of the church. None of these addressed the heart of the question though – knowing Jesus. It was a rare night in the Discipleship House, all five of the D House girls were hanging out in the living room with me and none of the guys were around or home. Relationship questions abounded and stories were shared as the night grew late. I was familiar with the question she posed to me: Can you know Jesus more when you are single or married? I’d wrestled over it for years myself. In my mind I always thought that knowing Jesus better single or married was an either/or thing. One of them must be a better way to know Jesus than the other. Perhaps it is not a matter of knowing the Lord better in “either/or” (either single or married) but instead a matter of greater importance to know Him in “both/and” (both single and married). Asking questions and wrestling in our souls is a beautiful thing, but we are asking the wrong kind of questions. The question isn’t which season of life can I know the Lord better in, but how can I know Him in the season that I am in now? Each story is beautiful, individual, song. The Lord will call to each of us to walk different seasons at different times, but the resounding bass in each call will be the same – to know Him. The melody will look different, but there will be a steady beat that does not change in your song. Him. A dear friend of mine married young and just celebrated her 10th anniversary. Her husband provided her with a safe home and a loving environment that freed her to begin to know the Lord’s love in a deeper way through her marriage. For me, the past decade of mostly going it alone has drawn me to the Lord’s love in a deeper way than anything I could have imagined. Had I married young, I wonder if I would know the Lord in the way that I do now? Would I have been too tempted to put my husband in the place in my heart the Lord should be? I don’t know. It’s not my story to know. Singleness has been one of the most refining fires in my life, but my married friends will say the same about their marriages. I’ve also tasted enough in a serious relationship or two to know that those relationships brought me to the throne just as much as my singleness did. It’s so easy to get caught up in comparing apples to oranges that we miss the bigger picture: its all fruit. And it’s all about knowing Jesus. Whether you are single, married, divorced, widowed, engaged, a parent, or childless – through EVERY season, Jesus wants to be enough for you. Marriage and relationships have their struggles, their loneliness and their happiness too. And they are different, but Jesus isn’t an either/or. He is in BOTH singleness AND marriage. I can’t tell you what’s better, but I can tell you that you are loved right where you are, and that He longs to know you and for you to know Him. And what I can also tell you is my story. Tomorrow. 🙂 Check back tomorrow for part 2. 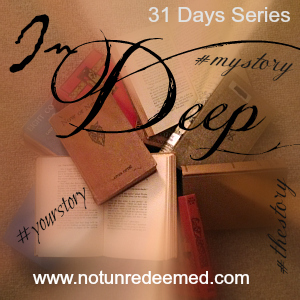 Categories: 31 Days - In Deep, Discipleship, marriage, singleness | Tags: Discipleship, In Deep - A 31 Days Series, Singleness | Permalink. 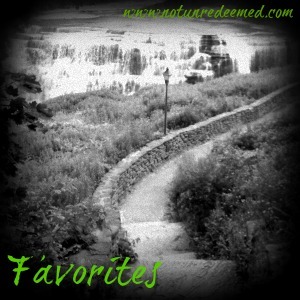 A beautiful guest post by Nichole from “A Readers Rumination“. Nichole is a mom of two, a passionate Jesus lover, friend, and former co host of the She Says Podcasts. Enjoy! “How are you doing?” my neighbor asked. I had been married for a little over three years, but I was lonelier than I had ever felt in my life. My husband and I married shortly after I graduated from college. We had the textbook “I Kissed Dating Goodbye” courtship (not without it’s bumps and bruises-after all, most of it was a long distance relationship) complete with sharing our first ‘I love you’ and first kiss after he proposed. After we married, we moved a couple hours away from family, both started new jobs and bought a house. Our daughter was born a few weeks before our second wedding anniversary. I quit working shortly before that to stay home and care for her. A few weeks before my meltdown outside my neighbors’ driveway, my husband had decided to try out for a role in a Christmas musical. He ended up landing quite a few roles and was gone most weeknights for practices. The show also traveled to different venues much of November and December, meaning he was also gone for many weekends. I had the option of traveling with the cast, but I chose to stay home with our daughter. I felt lonely, isolated from friends and family “back home” that I had know for years, and I was quite a bit resentful that I was “sacrificing” so much for my husband during this busy season in his life. I knew marriage wasn’t supposed to be an endless slumber party, complete with hot chocolate and heart-to-heart talks every night, but my husband was gone pursuing one of his dreams and making new friends in the process. I was a bit envious. In the midst of my tears, my neighbor hugged me and graciously invited me over for dinner a few times while my husband was away on the show circuit. I’m thankful for that and the many other graces God gave me during that season of our life. Looking back, I can see now how God used the loneliness and bitterness I felt during that season to expose my selfish presupposition that marriage should fulfill all my longings for friendship and relationship without the hard and awkward work of making new friends in a new town. I still have much to learn now, but more and more God is showing me how my identity is not wholly defined as “wife”. In fact, He often uses this identifier in my life to point out the many ways my heart is selfish and sinful. Being married has not fulfilled me in the many ways I had expected as a young bride. I still feel lonely and misunderstood sometimes, and like any close relationship often it is the people we live with that can hurt us (intentionally or unintentionally) the most. Marriage brings much joy, but also much pain into life as two sinners attempt to live with one another! In the midst of every happy and sad season, it is imperative to look to Jesus as the one who understands you, completes you and defines you. Doing that puts the pressure off of your husband (or future husband) in the relationship to be everything to you, and you both can ground your identities and activities together in a way that glorifies Christ. My husband is involved in the Christmas musical again this year. I have a four year old and a two year old to care for now while he is away most weeknights. Even though the cast is not traveling this year I know that this has the potential to be a busy, yet lonely season for me. What’s different now? 2. 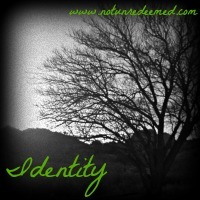 I am more intentional in my time spent with Jesus, asking Him to remind me of who I am. Jesus loves to remind us that we are His and that He has a plan for our lives. For some of us, that includes the roles of wife and mother, but do not think of yourself as lesser in God’s kingdom if He does not grant those desires in your life. As hard as that can feel, remind yourself that God can (and will) love you more perfectly than any husband could and that His plans for you will bring Him the most glory. 3. Speaking of a plan, I am also trying to be more obedient to the ways God wants me to advance the kingdom.It’s true that a husband and wife can work together to glorify God, but don’t discount the gifts He’s already given you as an individual. For me, that means writing more, singing more, taking more time in contemplative and intercessory prayer and reading books that spur my heart towards a greater affection for Jesus. I do my best to get together with friends (yes, I have friends now!) that encourage me and refresh my spirit. I am also in the process of starting a master’s certificate program, and I know my husband will be making sacrifices to help me (dishes, anyone?) as I embark on this new venture. I’d encourage you to take those three steps in your life if you feel marriage is becoming an idol in your heart. 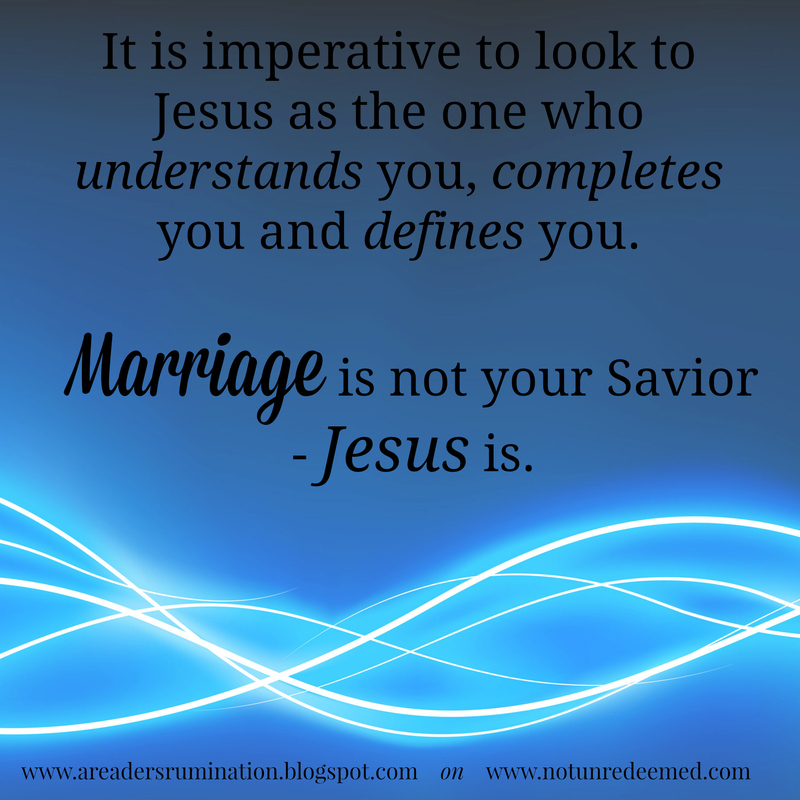 Marriage is not your Savior. Honestly, it can be like a crucible at times. God may or may not bring it into your life not to make you ultimately happy, but if you trust Him He will make you holy. If we let Jesus meet us, define us and direct us, whether we are single or married, we can know we are being the best wife, friend, daughter, church member, etc. He has meant us to be. That, my friends, is eternal. Categories: guest posts, marriage, singleness | Tags: Guest Posts, marriage, Singleness | Permalink. A guest post by a dear friend and writer, Lindsay Debach. Enjoy! This post is in response to our friend Katie’s challenge from the October 6th Post, entitled “Single Vision”, about embracing your life now, as a single person, being the best you can be. But I’d like to offer a bit different perspective…I am engaged and I liked being single. -You’ve got to share your time, your money, your emotions, your energy. – You’ve got to be vulnerable, with your feelings, your body, your weaknesses. – You’ve got to sacrifice (a deplorable concept in a consumer-driven culture) your plans, your space, your time. THIS DOESN’T SOUND VERY FUN TO ME! Especially after having lived as a single person just shy of 30 years. Yeah, you get lonely, but there are friends, family, and self-discovery. When you’re single, you can live that “pious” life when you go home at night. No one to share with, to have to listen to and be patient with, to get annoyed at. Not to mention what you have to sacrifice. In essence, you can be “confident in the flesh” (Phil 3:3) that is your own saintly behavior. But then…we wouldn’t need a Savior. for Christian marriage. Spouses will mess up, they will lose their patience, be unforgiving, say what they shouldn’t. But each instance is an opportunity for Christ’s grace to intercede. Through learning to love and share our lives with another, we have an opportunity to become more like Christ by seeing His redeeming work in how we love our spouse. Even in the bad times. A tall order, but isn’t that what every Christian should be pursuing anyway? That’s the kingdom of heaven played out right in the messy, over-tired, rainy day normality’s of life. It looks different whether or married or single, but the bottom line is that we should be pursuing the Father, no matter the circumstances. 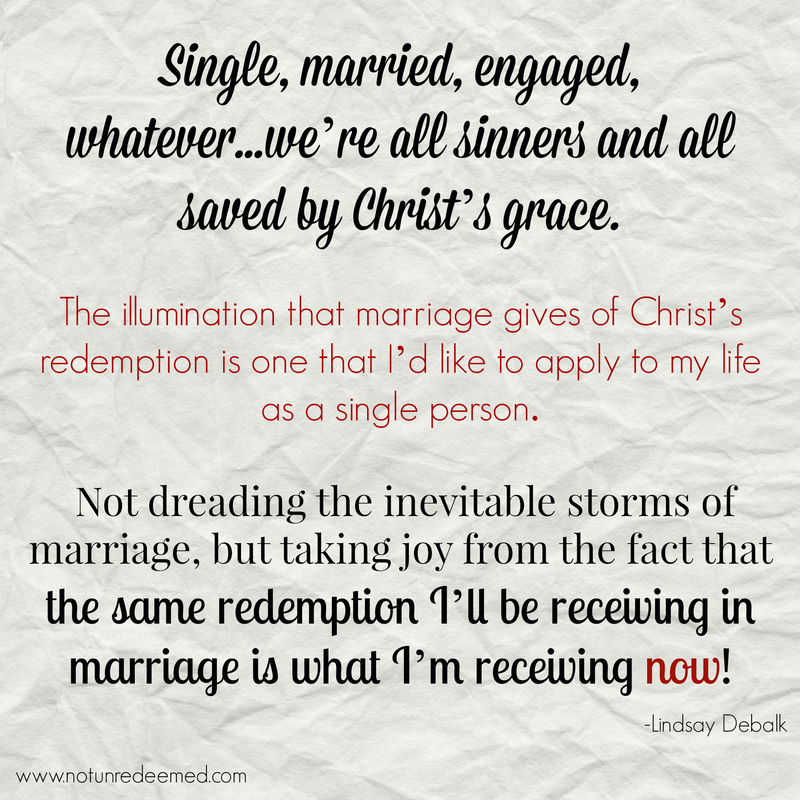 Single, married, engaged, whatever…we’re all sinners and all saved by Christ’s grace. The illumination that marriage gives of Christ’s redemption is one that I’d like to apply to my life as a single person. Not dreading the inevitable storms of marriage, but taking joy from the fact that the same redemption I’ll receiving in marriage is what I’m receiving now! When I mess up, when I’m not good enough, when I’ve been let down and have let others down. So as a single person who is “fully engaged” (pardon the terrible pun), I’d like to use this time in the middle to appreciate Christ’s grace to me. I will mess up, but I stand on the rock that is my salvation…even though it might look like the aisle of limbo. 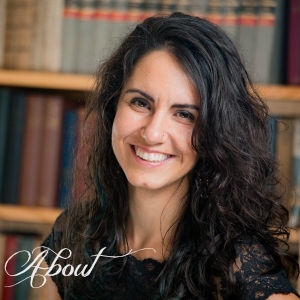 Lindsay lives life with gusto, and is passionate about theology, family, and culture. It was an honor to have her guest post today! 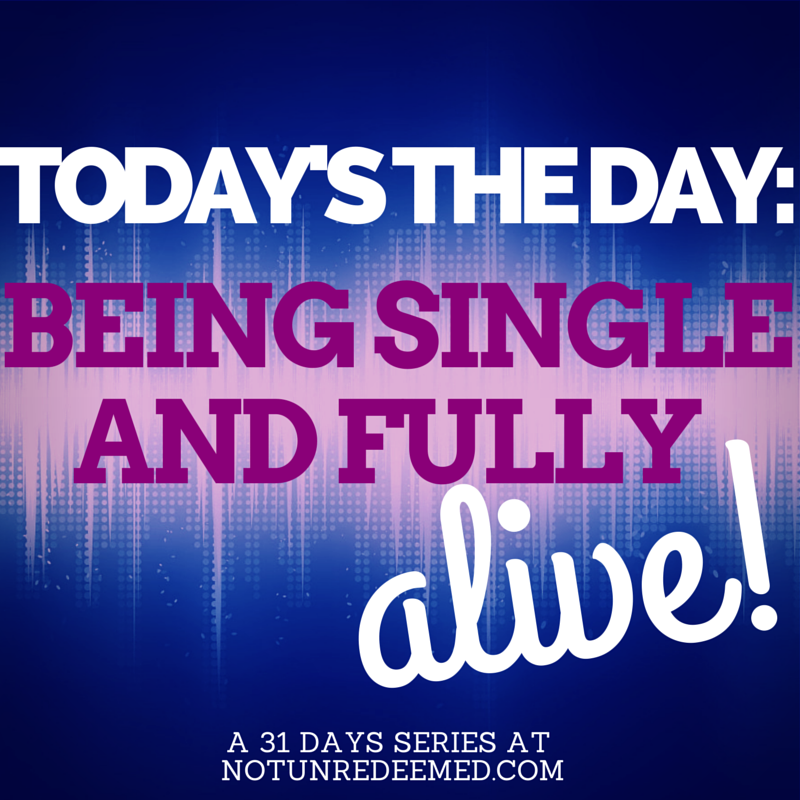 “Alive and Fully Engaged” is a part of the “Today’s The Day: Being Single and Fully Alive” a 31 Days Series. To read more from this series please click here. 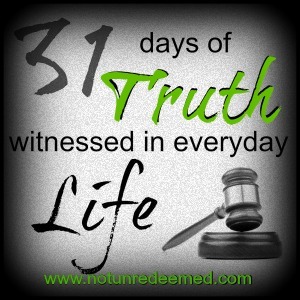 Categories: 31 Days - Today is the Day; Being Single and Fully Alive, marriage, singleness | Tags: 31 Days of Living Fully Alive | Permalink. “Sarah will get married before you”. What? I looked my grandfather in confusion. Sarah was 4.5-5 years my Jr. Surely, as the older sister I would get married first! If I could call up Heaven and talked to Grandpa, I would love to ask him what he saw, or knew, that caused him to make that statement ten years ago. He was right you know although He didn’t live to see it. My younger sister Sarah gets married next week and I’ll be standing up with her as her maid of honor. Sarah is number four in the line of my twelve siblings. Six weeks after Sarah’s wedding, my brother Joel gets married. He’s number six in the line up, and goodness – I even changed his diapers! As I contemplate how I pictured life being, it’s easy to start questioning a lot of things. As friend after friend, and sibling after sibling gets married, it’s hard not to wonder – why not me? Is there something they have that I don’t? Am I too picky? Not picky enough? Is it the way I look or dress? I’m terrible at flirting, is that it? The questions denote a subtle worldview/perspective that marriage is something that is earned, or that we can be worthy of. There is an underlying fear that we have been or will be found lacking in someway. Marriage is a gift from the Lord – like His other blessings. It’s not something we earn. Because of the way Christian culture promotes marriage it’s easy to buy into the idea that God owes us marriage. (I’m a huge fan of marriage don’t get me wrong.) But we just need to understand that He doesn’t owe us anything. He gives us His love – FREELY. We don’t deserve His love and yet He gives it to us, that’s the blessing and gift of grace. Undeserving people get married everyday. 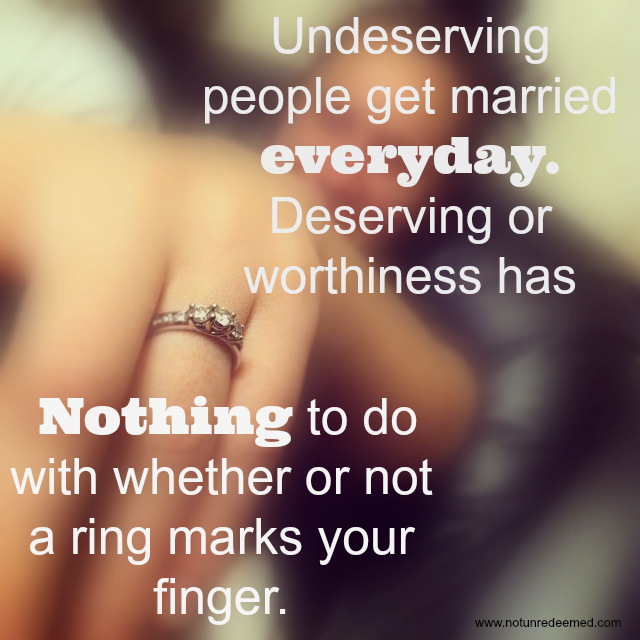 Deserving or worthiness has nothing to do with whether or not a ring marks our finger. We will never be ready for marriage or worthy of it, but we can be more prepared*. And that leads us to the second observation – fear that we are lacking. If I told you that you were not lacking, would you believe me? Most likely not. Why? Because in one way or another most of us are lacking in some areas, and we know it.We are redeemed saints learning to walk in Christ, but learning to walk means we stumble and fall at times and struggle until our muscles strengthen.The best way to deal with the fear of that we are lacking is to simply face it head on. Fear looses its power over us when we bring it into the light and pick it apart with truth. Force your fear to be specific so it’s small enough for you to address it. Addressing it with the Lord is the only way to go through it. We need His healing balm to heal the wound fear leaves. For example I can fear that I am too much. Making it more specific, I often struggle with fearing that I am too intense, too passionate and too opinionated.These fears were addressed by asking a close friend to speak into my life and give me feedback on them and how I interacted with people. I also brought them before the Lord. The Lord moves by either removing the fear and confirming to you have nothing to fear, or He will agree with you that there is a problem and address the heart issue behind it. In my experience the Lord usually does both. In the example above He confirmed to me that He made me passionate and to feel deeply the fiercely about things the way He does. In some areas, He asked me to be even more bold! (Imagine that – well really, if He hadn’t you wouldn’t be reading this series. I can assure you of that!) On the other hand, the Lord refines what He creates. He molds the created clay. With that my passion should never be used by sinful or judgmental motivation. *Wrapping it up with a note of caution: In facing areas we do need to change in, desire to change and grow for the Lord’s glory, not just so that you have a better shot at getting married. He is worthy – let us worship Him and not His gifts. Friend, the Lord is Sovereign and people choose. I do not know wherein the two entwine, but I do know this: the Lord loves you and is writing your unique story. I can’t compare my story to my sister’s for the Lord is writing two different scripts. We are both equally loved by Him. “What’s Wrong with Me?” is a part of the “Today’s The Day: Being Single and Fully Alive” a 31 Days Series. To read more from this series please click here. Categories: 31 Days - Today is the Day; Being Single and Fully Alive, series, singleness | Tags: 31 Days of Living Fully Alive | Permalink. My journey to living my list began with several mental decisions, heart shifts, and counseling. It was messy. Painful. Hard. But beautiful. They resulted (are resulting!) in much more freedom, fulfillment and joy than I would have imagined. As promised here is my list. The ways I started to live differently, and the ways I want to. As you read this,my prayer is for you to be encouraged, but this isn’t a magic list for you. This is what the Lord led me to do. The Lord will prompt YOUR heart in the areas He wants love and free you in. 1.Stop waiting for my life to be different and choose to make it different. 3. Plan weddings. I may not get to plan my own, but man do I get to have fun as a wedding coordinator planning other people’s. I used to believe it was cruel irony that I was becoming a wedding planner and planning everyone else’s weddings but my own. Then the Lord whispered, He was giving me these opportunities not as a cruel joke, or a dangling carrot but because I loved to plan! He was blessing me with joy of planning not just one wedding as most people do, but with many. 4. Choose beauty. Even over practicality and what others think – like pale pink skinny jeans in a redneck town. Oh well I never really fit in anyway! 5. Take a dance class. 7. Clean out my Hope Chest. This was a tough one, when I did it. I wept not just because of deferred hope, but because I had waited to start living in so many ways. Don’t get me wrong, it’s a great thing to save beautiful dishes till you get married. But my house is full of people now. Today. People I love and want to bless, and serve food to on beautiful dishes. 8. Stop living for the approval of others and the Lord. I’m already chosen and approved by Him. 9. Learn to have more fun. I can be much too serious at times. Because even more than I desire a family and a husband, I desire to live the life the Lord has blessed me with. To live it with gusto, to look at what He has created in me and for me, and agree with Him when He calls it good. “A Different Kind of List” is a part of Today’s the Day: Being Single and Fully Alive, a 31 Days series. For more posts in this series please click here. Categories: 31 Days - Today is the Day; Being Single and Fully Alive, Beauty, men, musings, series, singleness | Tags: 31 Days of Living Fully Alive | Permalink. When you get sick, you don’t have a choice, that’s life and it can be pretty miserable! When you are single you do have choices. At one time or another, it’s easy for most singles to fall into the trap that their singleness is a sickness and not just a season of life, or part of their lives. Several years ago I went through an extended time of unexplainable illness. It changed my life, and in many ways my life was put on hold as all of my time and energy was devoted to surviving. In those dark days the sickness was so consuming it threaten to become my identity. 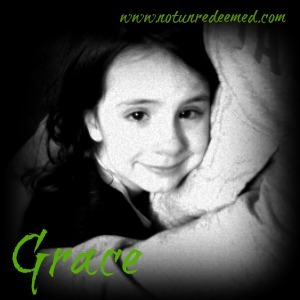 I wasn’t sickness, but when my world revolved around focusing on the sickness (or trying to prevent it!) It seemed that all that was left to “me” as a person was scars and diet regulations – the very reminders of the illness. Singleness can be that way too if we let it. When we focus on what we don’t have, on what other’s have, how awkward it can be to be the third wheel… it’s easy to start thinking of singleness as a dreaded sickness. 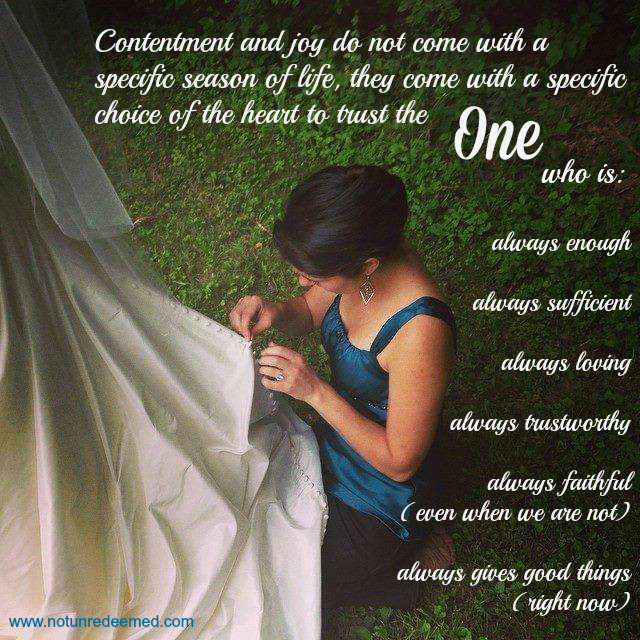 While singleness may be unwanted at times (or all the time depending on the season!) we are not sick. Singleness is not our identity. It may describe us, but it does not define us. You are more than ‘single’. Given a purpose and reason for living that goes beyond relationships. You are loved with a love that is stronger than death, and His love for you is more jealous than the grave (Songs 8:6). His love for you is not dependent on your relational status and does not change when your relational status changes. His love covers all sickness. Jesus did not come for the healthy, but for the sick. (Luke 5:29-32) If you are struggling in your singleness today, don’t condemn yourself. Christ enters into our pain and weakness! Did He not feel lonely at times? Yes. But He did not allow it to become His identity. The Father wants nothing more than to be invited into our sickness and pain. It’s there that He can heal. He can’t heal when we hide behind the mask of “fine”. The Father’s heart for you is to know that He doesn’t look at your singleness as a sickness; but rather as a gift He’s given, to show us that our value and purpose go beyond relational status. 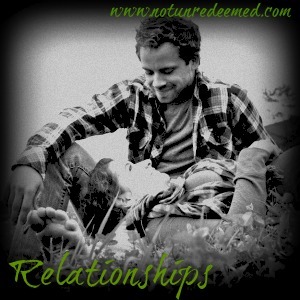 Being fully alive today is recognizing that your value does not come from a relational status. Even my married friends have shared with me, that this is a lesson that they have had to learn too. “You’re Not Sick, You’re Single” is apart of the “Today’s the Day: Being Single and Fully Alive Series. For more in this series please click here. Categories: 31 Days - Today is the Day; Being Single and Fully Alive, singleness | Tags: 31 Days of Living Fully Alive | Permalink.